Hard drive capacity is continuously increasing on laptop and desktop computers, making storage space for your files a little easier to come by. But many email services still have file size limitations for their attachments, which can make it difficult for you to send large Powerpoint presentations through email. 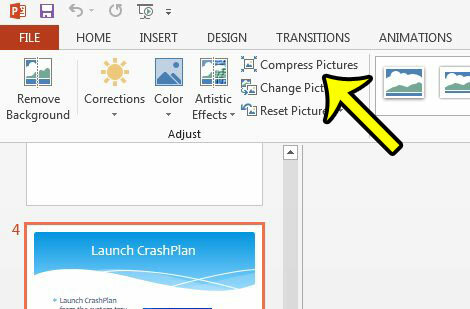 One way that you can reduce the size of a slideshow in Powerpoint 2013 is to compress the pictures that are in the presentation. Our guide below will show you where to find this option and apply it to every picture that is in your slideshow. The steps below are going to help you reduce the overall size of a presentation that you are editing in Microsoft Powerpoint 2013. We will be compressing every image in the presentation in our steps below, but you can also choose to only compress a single picture as well. Open the presentation containing the pictures that you want to compress. Click on any picture in the presentation. If you only want to compress one specific picture, however, then make sure to click on that picture. Click the Format tab at the top of the window, under Picture Tools. Click the Compress Pictures button in the Adjust section of the navigational ribbon. 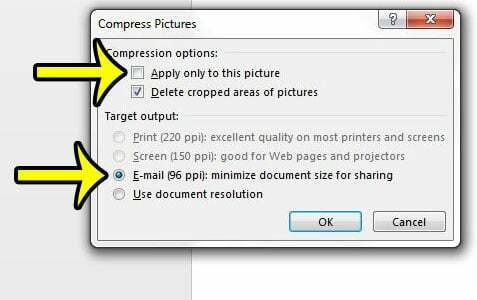 Uncheck the box to the left of Apply only to this picture if you wish to compress every picture in the presentation, click the Email option under Target output, then click the OK button. You can then save your presentation and it will be a smaller file size than it was with the uncompressed images. If you are concerned about losing image resolution, then you should consider saving the presentation with a different file name. This will create a new copy of the presentation, while leaving the original copy, with the uncompressed images, intact. Would you prefer to create a presentation with portrait slides instead of landscape slides? 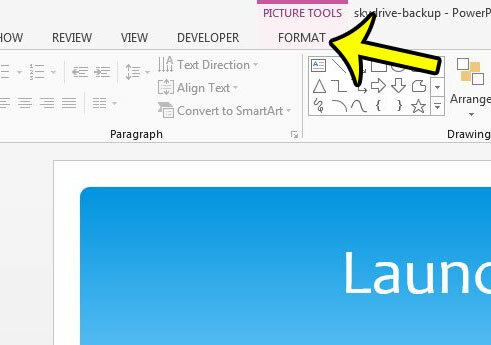 Learn how to change the slide orientation in Powerpoint 2013 if your slideshow requires a different layout.